Apple has recently been entrapped by iOS 8 screwup up to the hub, from U2-iTunes invasion to the HealthKit Bug, leading to a swath of complaints from users including iPhone 6/6 Plus users on media and SNS. 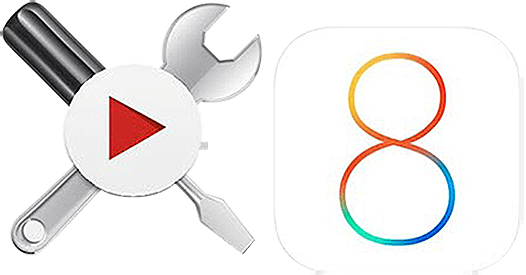 If you happen to be the one running into iOS 8 upgrade problems, this article will be helpful to you as it includes all the most common problems when updating to iOS 8, solutions as well as other useful tips closely bound up with iOS 8 upgrade. Use the most powerful iOS 8/9/10 data backup software - MacX MediaTrans to effortlessly backup and transfer iPhone iPad iPod photos, videos and music to Mac/PC at superfast speed, without losing any data. Here we've listed the most frequently complained problems or issues that you might encounter when updating to iOS 8 and walked you through how to fixed all these bugs if you find yourself getting into trouble with the new operating system. Problem 1: More than 75% iOS device users who try to upgrade to iOS 8 has got the warning of not enough free space to upgrade iOS 8. "What the hell with iOS 8? My iPhone 5S 64GB wants 5.7GB to install iOS 8." Solution: There are actually two ways to free up space on iPhone/iPad/iPod. Option 1: Delete data for more free space on your iOS devices. For instance, remove the apps and games that occupy too much space but are not used quite often; transfer photos from iPhone to Mac or move videos to computer and delete them from your iPhone; discard all text messages even in iMessage App; delete the useless Junk/temporary files, log files, browing/app cache, cookies, and other unnecessary files if you still have iOS 8 upgrade problems as this may help users, especially 8GH/16GB device owners, to regain 40-60% storage space; Please make sure you have at least 6GB storage on your iOS device if you plan to do the iOS 8 update directly over the air. Option 2: Generally, it needs twice storage to upgrade iOS 8 over the air than via iTunes. This is because the download and install process will be finished on your computer when upgrading iOS 8 on iTune, but the installation package will be downloaded to your device when updating on iOS device. Keep in mind that you will need at least 2GB storage on your device if you're going to upgrade to iOS 8 via iTunes. Problem 2:"I have been trying to update to iOS 8. But my pad has now stopped responding all together. It just got frozen problem while installing the new iOS." Solution: This may be caused by the internet connection or slow internet speed. Or you can reboot your device by holding down the Sleep/Wake button and the Home button for 10 seconds, then go to Settings > General > About to check the iOS version running on the device. Restart the installation process if it's not iOS 8. Problem 3: "I initiated iOS 8 update on iPad 2 last night at 6p. This morning, I find it stuck on the Apple logo, no progress bar." This is one of the most severe problem affecting users after iOS 8 upgrade. Solution: To fix this problem of iOS 8 device stuck on Apple logo, you can hold down the Sleep button to turn off your device; convert your iOS device to your computer to start iTunes; hold down the Sleep and the Home button for 10 seconds; release the Sleep button and keep holding the Home button till a message appears in iTunes; and select your device and click Restore option under Summary. Problem 4: Get a message of "Software Update Failed. An error occurred downloading iOS 8.0." Solution: Getting the error message isn't a big deal as thousands of iPhone iPad iPod users around the world are swarming for iOS upgrade. So you just try it again to deal with the iOS 8 upgrade problem. Problem 5: "I have the new iPad 3, but it took a long time to download iOS 8"
Solution: Generally, it takes 3h to download iOS 8 on iPad Mini and 6h on iPad 3, so a fast wi-fi connection is more preferred. Also, you can complete the iOS 8 installation via iTunes in 10-15min. You just download iOS 8 offical release .ipsw; connect your iOS device to computer and launch iTunes; click your iOS device on iTunes; just click 'Update', then you'll upgrade your device to iOS 8. Problem 6: "After I updated to iOS 8, there is a notification of needing 17GB to backup my iPhone." Solution: Many users found the need of more iCloud storage space to backup their iPhone, iPad or iPod touch. If you are stuck in the same problem after iOS 8 upgrade, following the tips below. Option 1: go to Settings > iCloud > Storage&Backup > Manage Storage > Delete old or unnecessary backups on your iOS devices. Option 2: go to Settings > iCloud > Select the unwanted backup options to turn off. Problem 7: Apple's iOS 8 operating system causes apps to crash about 3.3% of the time, or 67% more than last year's version. "Ever since I updated to iOS 8 on my iPod Touch 5 I've had 3 apps stop working completely. They won't stay open, they open for a second then crash. And my music app will no longer download any songs. It will say they are "download" but the files don't show up in the app." 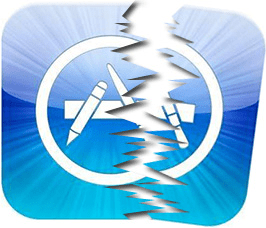 Solution: There are 5 solutions to fix apps crash problems after you upgrade iOS 8. Option 1: Double click the Home button and click on the app that has been crashing or failing to load and reload it again. Option 2: Hold down the Home Button and the Sleep/Wake button till the Apple logo appears. Option 3: Try a factory reset. Go to Settings > General > Reset and Erase All Content and Settings. Tips: Some apps that crash or fail to load are incompatible with the latest iOS 8. So these apps will certainly not work anymore once iOS 8 is installed. Problem 8: iOS 8 users see issues with battery drain and are curious about how to save iPhone 6s battery. Solution: To ensure you can extend the battery life, it's important to optimize the settings on your iPhone, iPad or iPod touch. Find apps consuming battery by going to Settings > Usage > Battery Usage; Turn off cellular data by going to Settings > Mobile and pressing the Mobile Data switch; press the power and home button until the device turns off to conduct a soft reset; turn down screen brightness; and turn off Bluetooth and airdrop. 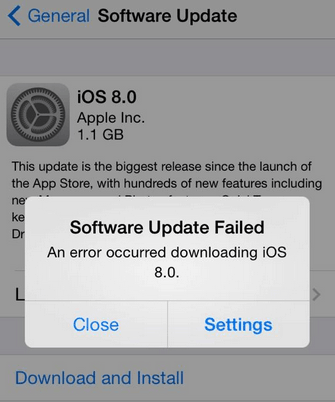 Problem 9: "My data lost from pages document after iOS 8 update from iOS 6.0.1." Solution: The data lost problem is not only seen among iOS 8 users but also users of iOS 7 due to a failed update or mistaken deletion of their device data. Thus, it is very neccessary for you to learn how to backup iPhone 6/6s/5s/se and other iOS 8 devices. Option 1: you can simply restore it from iTunes or iCloud if you've backed up your device. But please keep in mind that the restoration from iTunes or iCloud will lead to erase of existing content. Click to know how to backup data via iTunes or iCloud. Option 2: Since neither iTunes or iCloud supports selective data restoration, you can resort to an iOS data recovery tool to retrieve the personal data, media data and app data, etc. Problem 10: "It seems that the iOS 8 slow my iPhone down." Solution: If you've got the iOS 8 upgrade problem, please go to Settings > General > Reset > Reset All Settings > If prompted, enter passcode and confirm. Then wait a few minutes for iPhone to restart with settings back to factory specifications. Wanna know more information of the upcoming iOS 10 or feel puzzled about iOS 10 update? Please feel free to read ios 10 problems and solutions. 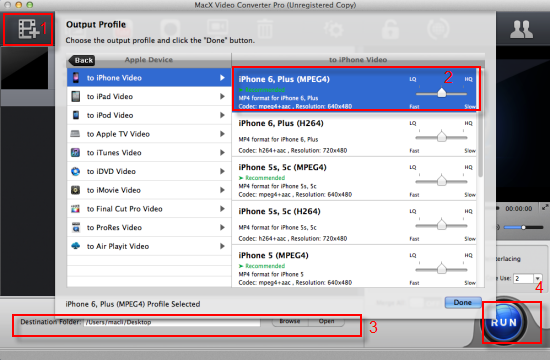 MacX Video Converter Pro - 100% safe and clean video downloader/converter for iOS 8/9/10-based iPhone iPad, to free download HD videos and movies from YouTube, Vevo 300+ sites to iPhone SE/6/6S, iPad Pro/Air 2/Mini 4 with 350+ profiles. Despite iOS 8 has fallen into users complaints for its many iOS 8 disadvantages, there are still a large number of people wishing to upgrade iOS 8 or downgrade iOS 9 to iOS 8 to enjoy its big enhancements, like revamped notifications, the Siri voice assistant, a new health app, etc. So if you want a smooth iOS 8 update without encountering problems mentioned above, making a good preparation is a triumph card. #1: Not all iOS devices can run on iOS 8. So you need to check device compatibility first before you do the update. Below are the iDevices supporting the latest iOS 8. 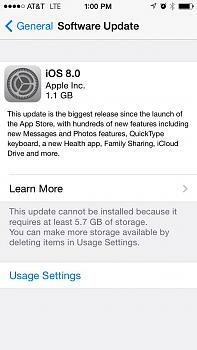 #2: Make sure there is enough storage for iOS 8 upgrade. The detailed solutions can be referred in the above section. #3: Backup data on iOS device via iTunes or iCloud in case of data loss. As it is mentioned above, it's recommended to conduct iOS 8 update via iTunes since it requires less storage and less time consumption. After you upgrade to iOS 8 via iTunes, you can even jailbreak iOS 8-based iPhone 6 (Plus). So here we provide the detailed guide on how to do iOS update via iTunes with no issue rather than on the air. Step 1: Update your iTunes to the latest version. Step 2: Click your iOS device on iTunes. Once you see information for your iDevice in the pop window, click "Update" to start upgrading your iOS 8 from iOS 7 or elder version. Compared with iOS 7, iOS 8 has much more disadvantages over advantages, even though Apple released the iOS 8.0.1 and 8.0.2. For example, it is unstable, slows down iPhone 4S, iPad 2, the new iPad and iPod Touch, drains battery life, and causes many apps quite working out of incompatibility issue with iOS 8, and many more. So many people choose to downgrade to iOS 7 after meeting iOS 8 upgrade problems. If you are regret upgrading iOS 8 with problems and issues but wish to downgrade iOS 8 back to iOS 7, follow the tips below. Step 2: Download the IPSW for iOS 7 based on your iOS device model to your computer. It's suggested to downgrade iOS 8 to the last iOS 7.12 and this downgrade process will take several minutes. Step 3: Connect your iDevice with computer and open iTunes (Please install the latest version 11.3.1 if not). Click on your device and move to the Summary tab. Hold down Shift key and click 'Update' in the right side. Choose the .ipsw file you've downloaded to your computer from the pop-up window. Click 'Update' and then start the downgrading process. Tips: It's highly recommended to use iCloud or iTunes to backup data before you upgrade or downgrade the OS on your iPhone or iPad as such iOS 8 downgrade process usually leads to loss of your data. Despite the bugs and problems you met after upgrading to iOS 8, the advantages iOS 8 has brought, like the support for third-party keyboards, family sharing, actionable notifications, etc, make it worth upgrading to unless you only want the basic tasks on your iPhone or iPad. For anyone who want to enrich the multimedia entertainment on iOS 8/9/10 devices, getting the best iOS 8 apps downloaded and installed beforehand is must-have. The following two piece of iOS 8 software will be introduced and prove the worth of iOS 8 upgrade on iPhone or iPad. MacX Video Converter Pro: An one-in-one hassle-free video converter for iOS devices integrated with excellent YouTube downloader, screen recorder, slideshow maker and video editor. It is able to convert HD (4K) and SD videos like MKV, MTS, MOV, WMV, FLV, AVI, etc to various formats playable on iOS 8/9/10-based devices, including iPhone 6s/Plus, iPad Air as well as Android mobiles like Samsung Galaxy Note 4/Edge, HTC One, etc. By the way, this software is given away now in celebration of the iOS 8-based iPhone 6/6 Plus release. Anyone can take part in the giveaway activity and get the best iOS app for free or go to iPhone 7 pros & cons page to learn information of 2016 iPhone 7's release date, features, specs, advantages & disadvantages and update tips. Ready for upgrading to the new iPhone 8/iPhone 8 Plus? This guideline offers you the easiest methods to transfer data from old iPhone to iPhone 8/iPhone 8 Plus without data loss. Are you encountering errors related to iOS 11 and would like to downgrade it to iOS 10.3, 10.2, or 10? Don't worry Here is the best way to resolve them is by performing. MacX MediaTrans is a full-featured iOS data management software to painlessly backup iPhone iPad iPod files to computer for freeing up iPhone/iPad space before upgrading iOS 7 to iOS 8/9/10.